I think a lot about language. How to have conversations that move people into action. How to write a compelling blog post. And yet, here I was, having an infuriating conversation with my spouse who could not hear what I was saying, because of the way I was saying it. One of the most powerful things we can do as we step into all the courageous opportunities of this New Year is pay attention to the way we communicate. I’ve written before about Getting Ego Out of the Way – but what is the flip side of that coin? How can we Communicate with Confidence? You might need to practice. If others in your life aren’t used to you having an opinion, they will push back. This took some time for me at first. I was used to having an opinion in small groups, with people I work with regularly and trusted. But others, in large groups? If you’re surprised (after seeing me voice opinions in front of hundreds at a product feedback session, or speak in front of thousands at Dreamforce) let me tell you this: like any leadership skill – this is one that must be practiced and can be learned. Anything can be learned. Some of us just take more time to get our monkey brains out of the way. How fast will you learn how to flex your opinion muscle? Here’s what I did at first. I thought about one of the most forceful speakers that I knew – she’s an amazing technologist in this ecosystem and my former business partner – Tracy Kronzak. And I summoned my biggest Tracy. When I felt nervous or weak – I summoned my Tracy, and spoke up the way I thought she would – whether I felt like it or not. And guess what? After years of practicing, I now just get to summon myself. Becoming a technical leader, in your organization, in your user group, requires that you have an opinion. And the wildest, crazy truth that you may never hear is that the more often you have an opinion (expressed with compassion, connection and conviction) the more folks will ask you for it. If people don’t hear you at first, repeat yourself. Send a follow-up email summarizing your key points (it works!). With that being said, I’m no expert but I might think you could think about doing something like that, if you wanted to try it. What?!?! Why do we litter our speech and our written word with bits that completely undermine what we say? Once I heard a small group leader tell a story about his son. It was an amazing way to simplify a complex thought – and I told him later how powerful the story was, and how I’ll always remember it. I also told him that when he said “this may not be life-shattering” (twice) that it was very distracting and decreased the real impact of his words. First we must recognize when we’re inserting disclaimers. I stop about 75% of my disclaimers simply by being aware that I don’t want to use them, and then pausing before I speak. I need accountability from trusted friends and peers for the remaining 25% that still sneak about the margins. Now I will write an email, and before hitting send, do an edit to strike disclaimers and tighten up the language. I don’t get it right 100%, but wow, the progress I’ve made! I learned this one recently from Emma B-F who was interviewed by Gillian Bruce on the great AwesomeAdmins podcast. The concept is this: Say an opinion, and then wait. Don’t try to fill the space with more explaining or softening. Just say it, with confidence, and…………. Sometimes the other person will squirm. In other cases they will pause to think. Either way, when I stick the landing I become a more convincing communicator. Each journey must begin with a singular conviction, but gains momentum surrounded by others. 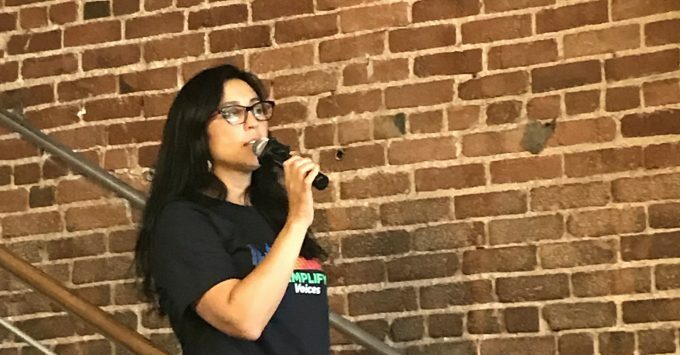 That’s why I truly appreciate Amplify, and the way that Marisa Lopez (pictured above) has taken the realm of this group from Joni Bryan and fostered voices across the Salesforce.org ecosystem, who are in turn supporting and bringing out courageous communication in others. There are also dozens of Women in Tech groups with a home in the Trailblazer community, and my favorite conference (besides Dreamforce) of last year – WITness Success. Want more food to feed the confident communicator? Check out the podcast I recorded with Gillian Bruce last month “Transform your Org through Conversation” and the podcast recorded by Emma “How to Own your Role with Emma B-F“.